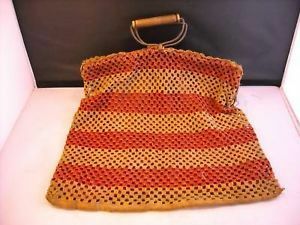 This is a listing for a tan and red vintage handbag. It has metal hinges with wood around the handles. It is made of crocheted heavy yarn over red fabric. It measures 15 1/2" x 17." The wood is missing from one handle and it is slightly faded.